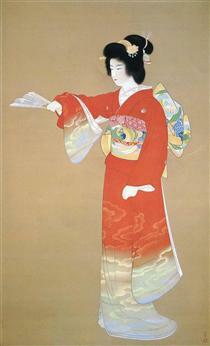 Uemura Shōen (上村 松園, April 23, 1875 – August 27, 1949) was the pseudonym of an important artist in Meiji, Taishō and early Shōwa period Japanese painting. 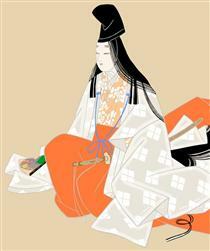 Her real name was Uemura Tsune. 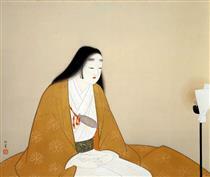 Shōen was known primarily for her bijin-ga paintings of beautiful women in the nihonga style, although she produced numerous works on historical themes and traditional subjects. 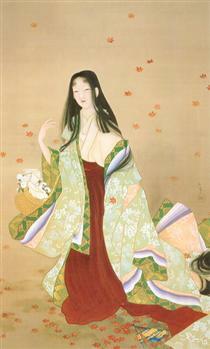 Shōen is considered a major innovator in the bijin-ga genre despite the fact she often still used it to depict the traditional beauty standards of women. 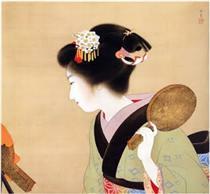 Bijin-ga gained criticism during the Taisho era while Shōen worked due to its lack of evolution to reflect the more modern statuses of women in Japan. During bijin-ga's conception in the Tokugawa, or Edo, period, women were regarded as lower class citizens and the genre often reflected this implication onto its female subjects. 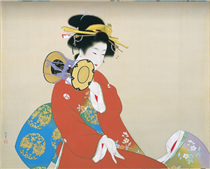 Within the Taisho era, women had made several advancements into the Japanese workforce, and artistry specifically was becoming more popular outside of pass times for the elite, which opened way for Shōen's success. 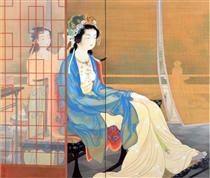 Shōen received many awards and forms of recognition during her lifetime within Japan, being the first female recipient of the Order of Culture award, as well as being hired as the Imperial Household's official artist, which had previously only employed one other official woman in the position. 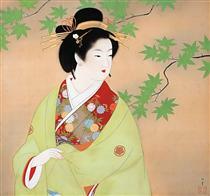 In 1949 she died of cancer just a year after receiving the Order of Culture Award. 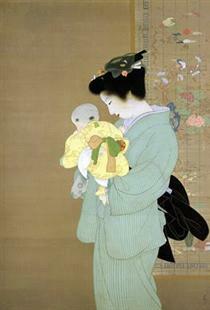 Shōen was born in Shimogyō-ku, Kyoto, as the second daughter of a tea merchant. She was born two months after the death of her father and, thus, grew up with her mother and aunts in an all-female household. 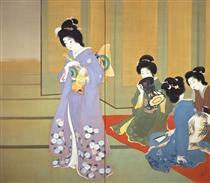 Her mother's tea shop attracted a refined, cultured clientele for the art of Japanese tea ceremony. 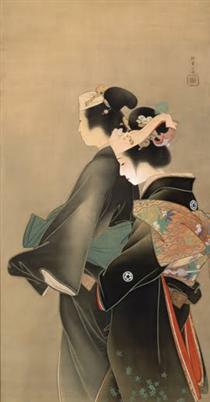 As a child at age 12 (1887), Shōen drew pictures and exhibited considerable skill at drawing human figures. 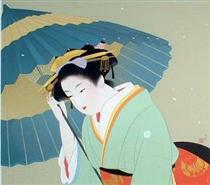 By the age of 15 (1890) she was exhibiting her work and winning awards in official art contests as well as commissioning work for private patrons. 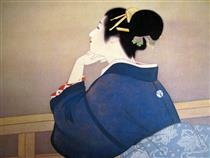 She became obsessed with the ukiyo-e, Japanese woodblock print, works of Hokusai. 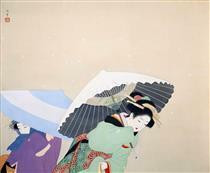 Her mother supported her decision to pursue an artistic career. 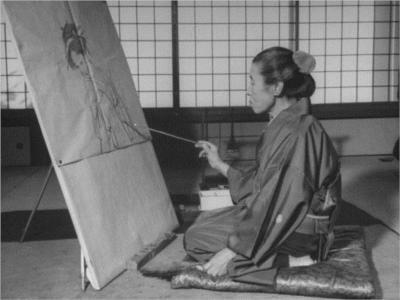 This was quite unusual for the time, and although Shōen did have successful contemporaries who were female, such as Ito Shoba (1877-1968) and Kajiwara Hisako (1896-1988), women were largely still not part of the Japanese public art scene outside of Tokyo. 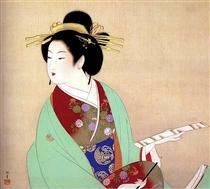 Among Japan's wedding traditions, specifically among upper-class unions, brides were gifted a konrei chōdo (bridal furnishing set), usually containing art supplies, such as brushes and paints. Provided with the necessary tools, many women pursued painting as an individual and private hobby, out of the public eye and in an amateur setting. 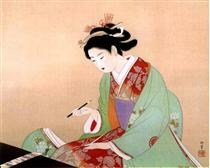 Due to most women of the time's lack of formal education in the arts, few made a professional career of painting, regardless of how talented they may be. However, women living in the company of a professional artist, such as their fathers or husbands, had the resources and guidance to hone their skills in the craft, although few of these women became known for their work as an individual away from their educators. 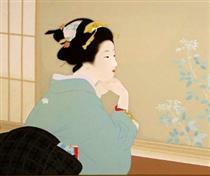 unknown title (Bijinga) Uemura Shoen ?